In Romania, the economy is emerging from a protracted period of depression. Recovery is driven by net exports and the accumulation of stocks, while domestic consumption and gross fixed capital formation continue to contract still further. Implementation of the 2011 budget execution is on track and should meet the deficit target for the current year. 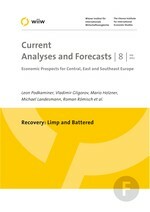 The forecast for the election year 2012 points to an acceleration of economic growth and no increase in fiscal austerity. This will be followed by renewed stabilization measures and slower economic growth in 2013.